A historian at Wolf Creek Park in southern West Virginia documents a stone remnant of the mining industry there. Historians from West Virginia State University are seeking historical information about the Wolf Creek plateau area in central Fayette County, particularly the 1,000-acre Wolf Creek Park development between Oak Hill and Fayetteville, West Virginia. 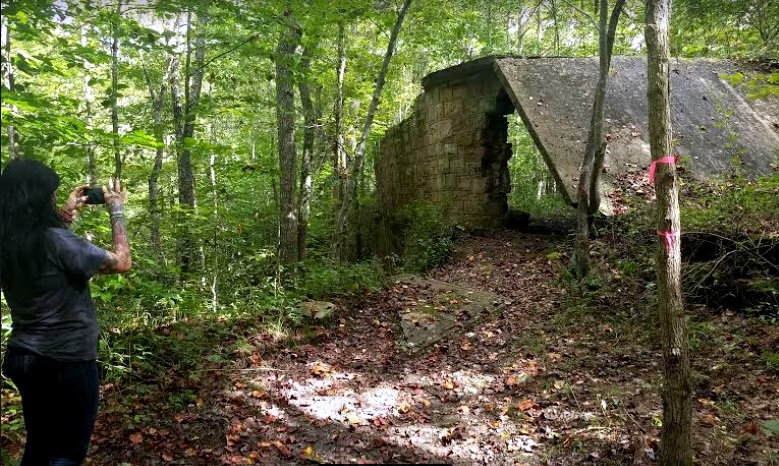 According to Billy Strasser, a spokesman for the New River Gorge Trail Alliance, the team is conducting a research project and field survey to understand the historic uses of the property and document interesting qualities and features. “Historically, this plateau area supported farm communities, so stories and information about farm families, agricultural methods, and farm organizations are of great interest,” Strasser said. The trail alliance is requesting that anyone with information, photographs, or anecdotes about Wolf Creek Park contact Michael E. Workman at mworkman2@wvstateu.edu or the National Coal Heritage Area Authority at 304-465-3720. Wolf Creek Park is a mixed-use development for housing, business development, and outdoor recreation for the New River Gorge region, Strasser said. The team will incorporate the information in a report that will help guide development and management of the area. This study is funded in part by the National Coal Heritage Area Authority, which preserves, protects, and interprets lands, structures, and communities associated with the coal mining heritage of southern West Virginia. The study is being overseen by the New River Gorge Trail Alliance, a nonprofit organization that seeks to create a regional trail system and has acquired funding to build new trails in Wolf Creek Park.